Fancy helping to design a computer game in one day, creating characters to bring it to life, or building your own PC? A weekend dedicated to gaming and computer technology will celebrate the finale of Dundee Science Festival this weekend. Abertay students gearing up for the weekend! ‘Gaming and Digital Technology Weekend’, which will be held at Dundee Science Centre on both Saturday 12 and Sunday 13 November, will see local games designers and digital experts showcase their high-tech expertise and innovations to families from 10am until 5pm. With games to try, and experts to quiz, visitors can delve into a digital world, take on a laser obstacle course and even build their own PC in one of the bookable Junkyard Clusters workshops. Activities will be provided by Abertay University, Dundee and Angus College, EPCC, University of St Andrews and V&A Museum of Design Dundee. Both days will offer one-hour Junkyard Clusters workshops, with Alistair Grant from the Edinburgh-based supercomputer centre EPCC showing visitors how to build their own computer, plug it in, start it up and make it work! Meanwhile, Abertay students will hold a ‘games jam’ to develop a game live over the weekend where visitors can contribute to ideas and get an insight to the game development process. At the end of the process, students can hopefully present the finished game. V&A Dundee will also be bringing their VR (Virtual Reality) headsets from 12-2pm to give visitors a 360 degree view of the waterfront development as well as a peek inside the V&A Museum of Design Dundee through an App developed by Luma, while iSandbox will engage visitors in their immersive sand play experiences, which use augmented reality to bring sand to life! 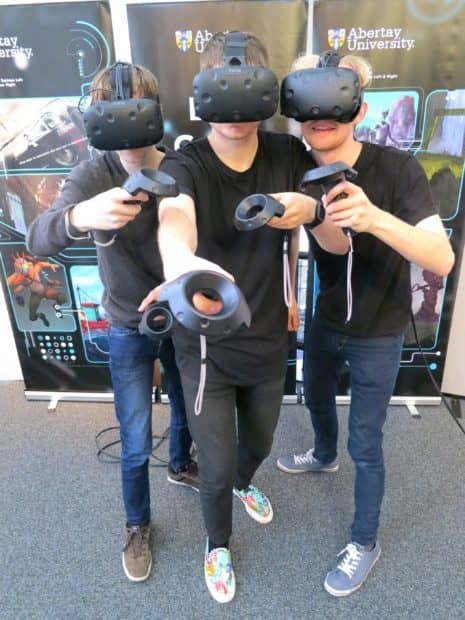 Saturday will also see Abertay’s Division of Games and Arts showcasing demos of videogames, which will include a demonstration of Virtual Reality by a student team. Other student games on display will involve a range of topics, from Scotland’s role in the sugar trade to a game about British shark species. Raspberry Pi workshops will also run throughout the day with Dr Paul Robertson. Sunday will see the return of Abertay students and graduates revealing their cyberpunk-themed ‘visual novel’ game which is currently under development. Using paper cut-outs of characters, clothes/accessories and other props, visitors can design their own paper character! Dundee & Angus College will also be demonstrating programming, robots and networking. The event will run on both Saturday 12 and Sunday 13 November, from 10am until 5pm. Booking is essential for Junkyard Clysters workshops with pre-payment required to secure a place. To book, phone (01382) 228800 or email festivals@dundeesciencecentre.org.uk. Normal admission applies. Members and under 4s free of charge.